BEREA, Ohio (CNS) — The request arrived from the Philippines in 1997. The stranger asked for rosaries and other religious materials to distribute among the poor. Could Tilma, “Our Lady’s store,” help him? Alone in her little brick shop in the small downtown area of this Cleveland suburb, Jan Marie Shannon prayed aloud. Shannon had opened Tilma barely a year earlier and named it for the cloak on which Our Lady of Guadalupe left her image when she appeared to St. Juan Diego. Although the storekeeper’s new business was struggling, she stuffed a box with merchandise and sent it to college student Al Benedick Taguinod. She did not include a note. To Shannon’s surprise, Taguinod wrote back, thanking her and detailing the dispersal of her gifts — a tradition that endures 19 years and 291 shipments later. 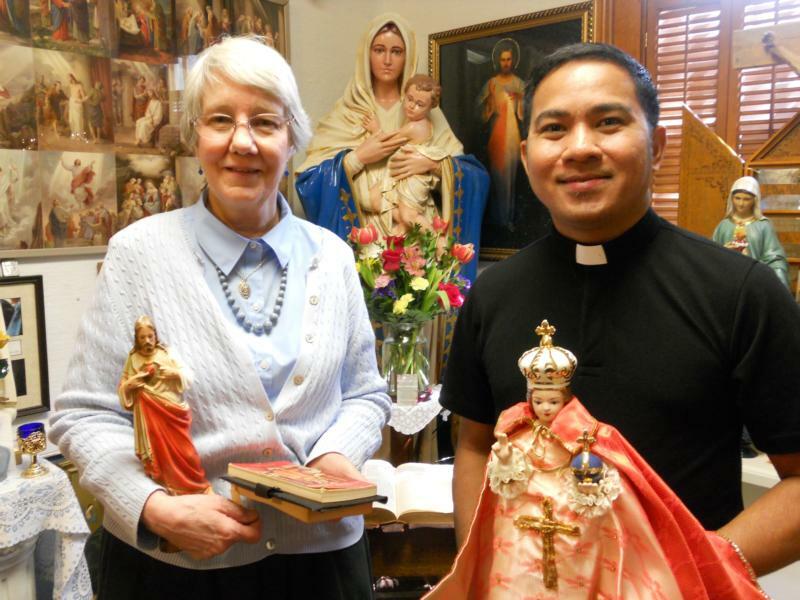 When Shannon showed her letters from the Philippines to customers, they soon began to bring her statues, crucifixes and other items intended for Catholics half a world away. Father Taguinod, during a visit to Ohio in April, reflected on the ways Shannon’s shipments affected his life. In his homeland, some Catholics leave the church for sects that aggressively recruit them. He soon began an apostolate to promote the Catholic faith and to distribute donated religious articles. As part of a college requirement, he taught weekly catechism classes to children so destitute they lived at a garbage dump. He presented rosaries and holy cards to his little pupils and other items to parochial schools and church groups. Books went to monasteries and several small chapels received statues. He later shared parcels with fellow seminarians to take to parishes in their hometowns. Twelve years passed before Father Taguinod met the woman he now calls “Tita (Aunt) Jan Marie.” When his community sent the seminarian to Massachusetts in 2009, a men’s prayer group bought him a plane ticket to Cleveland. He easily spotted Shannon at the airport; she was holding a banner of Our Lady of Guadalupe. Shannon managed to send one or more cartons to the Philippines every month throughout the years. One day, she arrived at the post office to learn the U.S. Postal Service had doubled its rates for surface mail. Unable to pay the increase, she returned to Tilma with an unsent package. That same day, a customer told her about a shipping service that charged a flat rate for larger boxes. Another woman offered to cover shipping fees. Time and again Shannon has witnessed what she calls “coincidences,” attributing them to Mary. In December, on the feast of the Immaculate Conception, Father Taguinod received a delivery shortly before he celebrated Mass. Individuals who patronize Tilma send Father Taguinod money to help with a monthly meal program for underprivileged children at an elementary school in Santiago Isabela, his hometown. Volunteers sew dresses for the girls and shorts for the boys. Tilma customers also provide combs, toothbrushes and school supplies to assist with daily needs. After the Philippines was hit by a devastating typhoon in 2014, Shannon and her husband, Joseph, traveled there. Since his ordination, Father Taguinod has returned to Ohio a few times when his community sent him to the U.S. On April 13, he celebrated Tilma’s 20th anniversary with a Mass of thanksgiving at a Cleveland parish. Afterward during a reception he described discovering the shop’s business card on his desk almost 20 years ago. To this day, he does not know who put it there. But he is certain about something else.